Order Imprinted Pet Trash Bag Dispensers – contains 1 roll of 20 poly bags for convenience when cleaning up after your pet. Featured in Blue, Green, Red, Orange, White, and Black. Imprint area 1inch x 1inch. 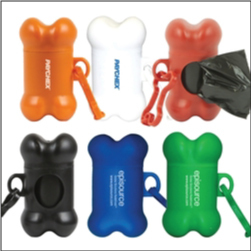 Dog bone shaped pet bag holders attach to the leash or other convenient locations. Great for dog walkers, pet sitting services, etc. A great handout for pet related events and trade shows. Order Imprinted Custom Leaf Shaped Notepads – feature your logo or business information on these beautiful leaf shape printed paper adhesive pads. A very popular product with tree and landscaping services, non-profits, realtors, eco-friendly inspired events and causes, and more. Ordered in increments of 250. Made in USA. 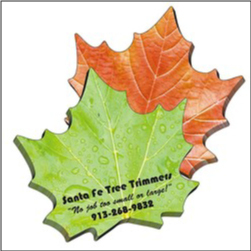 Get your custom leaf shaped adhesive note pads today! 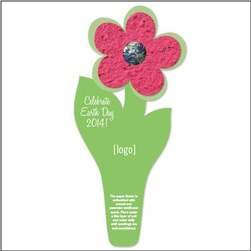 Order imprinted Custom Seed Paper Bookmarks – the perfect eco friendly item die cut in the shape of a flower and stem. Great for promoting Earth Day, eco-friendly events, perfect for handing out at tradeshows or including with book signings, etc. 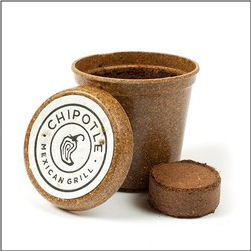 Available in 21 colors, Seed paper made from 100% recycled paper embedded with wildflower seeds. It grows when planted! 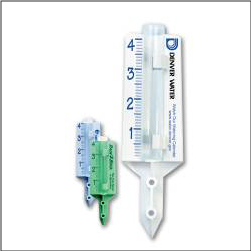 Order custom Imprinted Rain Gauges – perfect for lawn care providers, garden centers, sprinkler companies, nurseries, municipalities, water providers, etc. to help measure water usage or rain fall and help to promote water conversation. Features 4inch rain tube gauge. Turnaround 10 working days. Made in USA. Order your custom printed rain gauges today.